If you run a fitness club, gym, or if you’re a personal trainer, WordPress offers a great solution for creating and running your website. With these niche fitness WordPress themes, it has never been easier to quickly get your website up and running. These fitness WordPress themes have been shortlisted for you if you want to be a fitness blogger or want to showcase your fitness studio online. Each theme offers its own set of layout possibilities, widget and plugin support with their sleek and cutting-edge interface. You are bound to find the theme that gets your followers excited and make a run for their gym shoes. 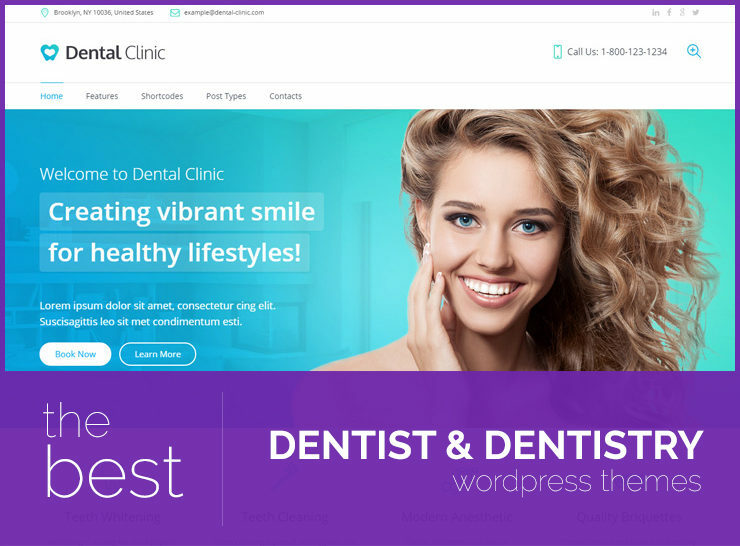 All these fitness WordPress themes themes require a self-hosted WordPress site. 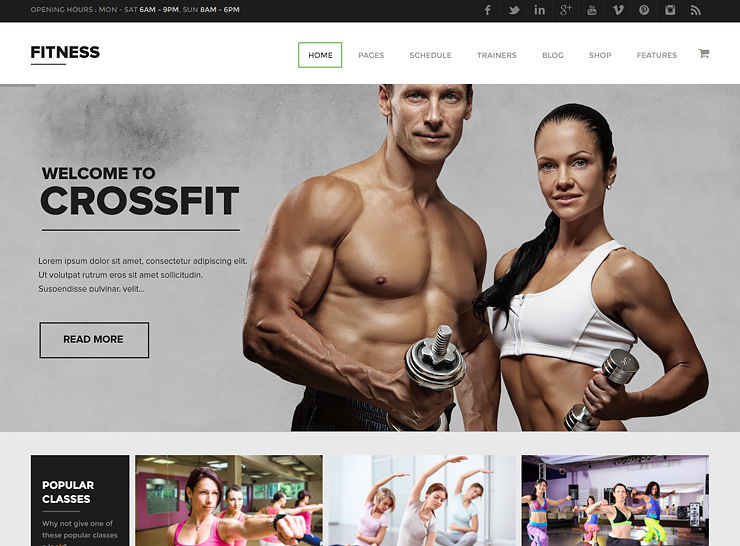 This is a modern and sophisticated looking fitness WordPress theme. It is muscle packed with features to give you an edge over others. 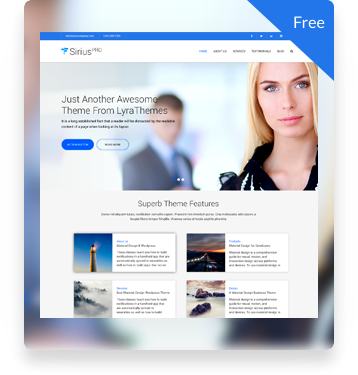 This theme has a robust front end editor, a unique text editor and a wide variety of layout and header options. Massive Dynamic integrates seamlessly with top plugins like WooCommerce, Visual Composer, Slider Revolution, Master Slider, MailChimp, Contact Form 7, and WPML with RTL support. Several sites that use Massive Dynamic are in Urdu, Arabic or Persian Langauge. It is fast, optimized, retina-friendly, and suitable for crisp image display. Massive Dynamic offers 50+ demos to choose from through one-click demo import. The theme offers 70 distinctive shortcodes to modify site elements. It includes predesigned pages for blog posts, search, shopping cart and latest portfolio projects. This theme is ideal for a gym, fitness club or a fitness related blog. It offers key plugin integration with great design and seamless integration. Great flexibility with a power-packed punch in one theme. Entrepreneur is a beautiful theme designed around the needs of small businesses. It is ideal for a gym, fitness center, yoga classes, and health centers who want to monetize their site and run a booking based system. This theme works great with WooCommerce and allows for calendar management with booking options. Use Google Calendar or Outlook integration to seamlessly integrate your calendar bookings. You can use Stripe or PayPal for processing payments. Entrepreneur comes bundled with a premium booking plugin, a powerful form builder, autoresponder options, Master Slider plugin, 7 demo options and support for multi-languages. This theme is already running on 2,000+ sites and is great for a small fitness or health related business that runs on personal bookings. You can check out a demo of this theme here. Gym and Fit is a fitness theme for WordPress designed for class schedules and timetables. It works well for fitness classes, gyms and health clubs that run specific class schedules. Gym and Fit offers great features including 10 header layouts, 20+ footer layouts, 4 predesigned skins, homepage layout options, 30+ page design options, menu styling options, and more. This makes the theme flexible and easy to configure. Several plugins integrate well with this theme. 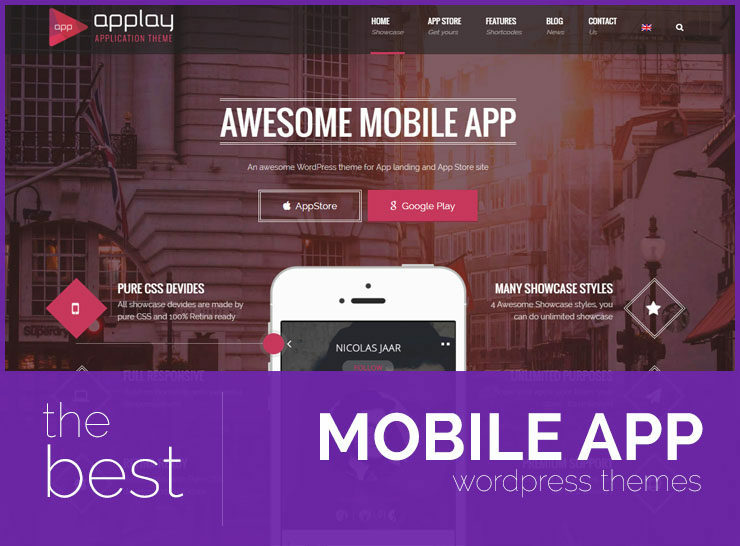 Recommended plugins include Event Calendar for events and classes, Visual Composer for page composition, Slider Revolution for great image sliders, and WooCommerce for monetization of classes. The theme is great for a small gym or fitness classes setup that wants to set up a site quickly. With one-click demo imports, the site can be ready in minutes. 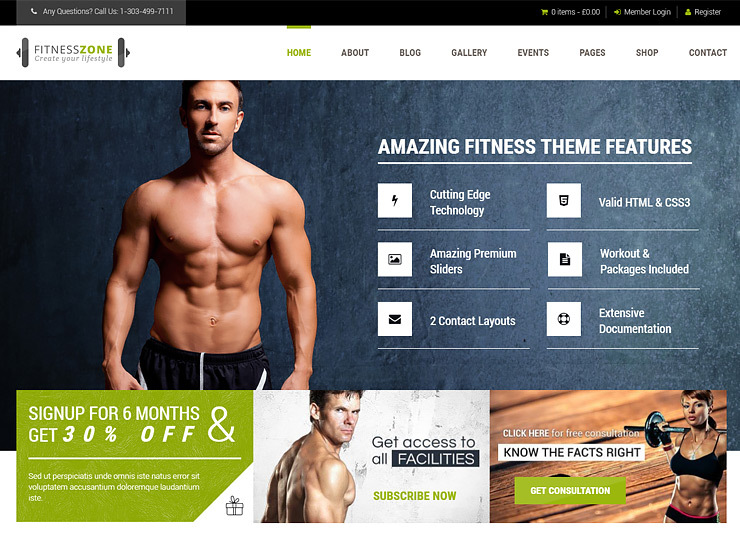 Fitness Zone is one of the ideal fitness related WordPress themes available. It is designed keeping in mind workouts, classes, and gym schedules. The theme offers 5 homepage options, 5 header styles, 12 different design skins, tons of shortcodes, pre-designed forms like BMI Calculator, and predefined page options like Workout Page. You can add FAQs, testimonials, trainer profiles, quotes, class schedules, events, and contact forms easily with this theme. Plugin support includes WooCommerce, Events Calendar Pro, BuddyPress, Google Maps, Timetable Responsive Schedule, and Awesome Builder. The theme is power-packed with features and is ideal for the novice user. Creating a website for your gym or fitness class is simple with all the plugins and features available with this theme. Yoga Fit is a flexible and feminine theme for fitness and yoga. 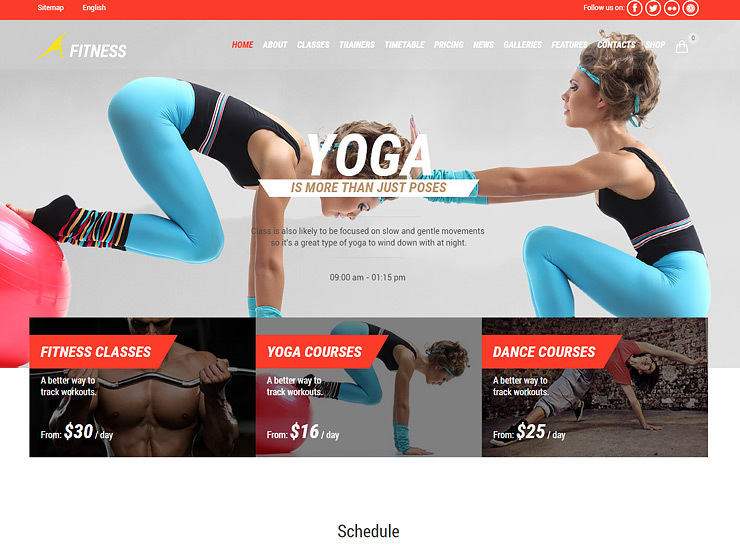 This theme is designed around the needs of yoga studios, dance studios, Pilates, and other schedule related classes. Yoga Fit specially caters to classes, schedules, and timetables in fitness and health businesses. 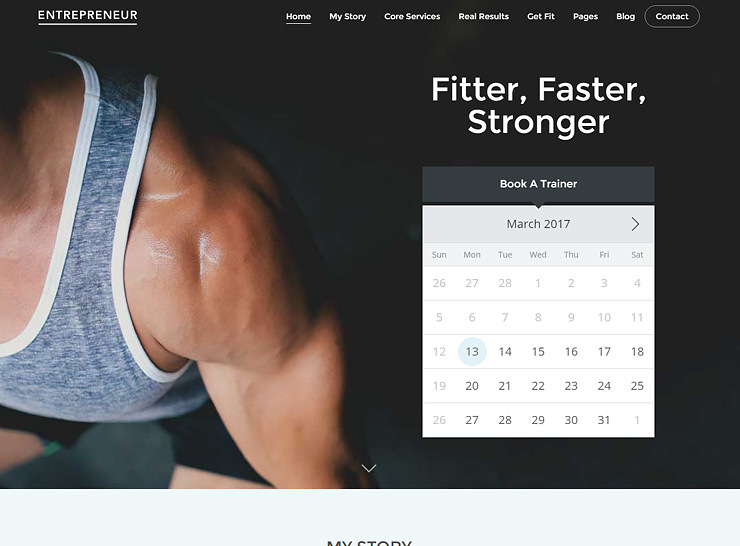 This fitness theme for WordPress combines several plugins like WooCommerce, Events Calendar Pro, Slider Revolution, and LayerSlider. It packs shortcodes and widgets and supports quite a few page designs and unlimited color options. You can add more to your website with a custom form designer and drag-and-drop page designer added with this theme. It offers landing page and multipage options depending on the need of the business. This theme offers great flexibility with tons of features, ideal for a timetable based fitness studio. As a novice user you can use this theme to design your website quickly with a class schedule. Fit is a great responsive theme for fitness blogs, gyms, fitness studios and training websites. It is ideal for businesses that want to run cross fit training programs, boot camps and other similar classes. It offers great flexibility, multiple color theme options, custom post types for trainers and classes, and contact forms. Fit includes 1- design PSD files and the full HTML version along with localization files for any customization needs. 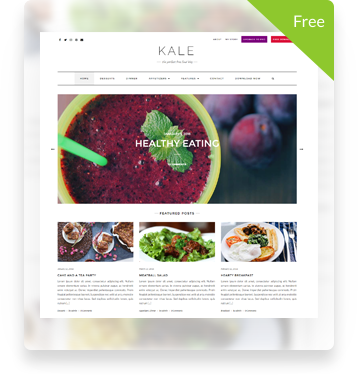 It boasts of 3,000+ sales and holds great promise as a WordPress theme for fitness blogs and fitness related magazine sites. Fit is a great theme to start with if you are a savvy WordPress user with a fitness streak. Sport is an ideal theme for a fitness related business. This theme will work tremendously for you if you run a gym, a sports center, fitness club or if you are a personal trainer. This theme can cater to events, trainer profiles, workouts, timetables, classes and tariffs. Sport includes custom posts, widgets and shortcodes for these elements. It includes LayerSlider for slider based images, custom designs for roster and timetable management, and unlimited color options. This makes the theme flexible, easy to use and quick to configure. For a savvy user this theme is like a dream. This theme can work great for the novice user as well. 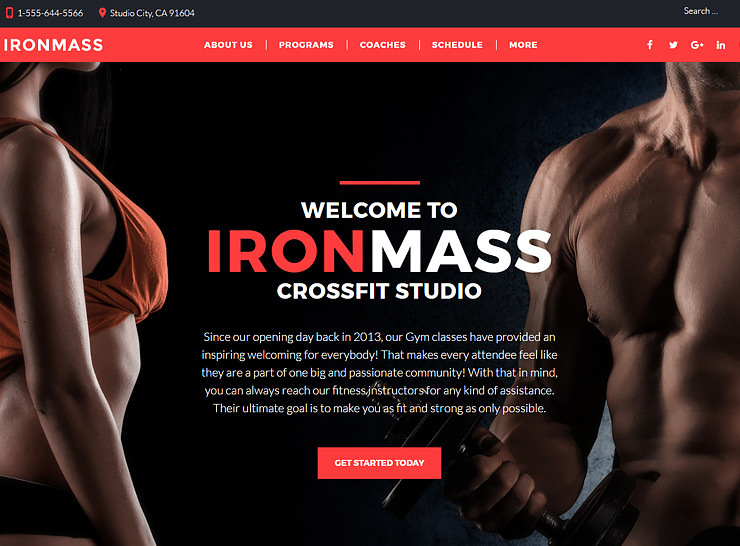 IronMass is a fitness theme for WordPress keeping in mind needs of the gym and body building. This theme is designed in red and black to depict a typical body building blog setup. The theme has tons of features designed around local gyms and fitness clubs. This theme is built on Cherry Framework 5 and is clean and responsive. IronMass includes timetable plugin, appointment manager, a custom drag-and-drop page builder, and content module designer. The content module designer has different content design options like accordians, timers, blurbs, call to action, and more. This theme boasts of clean code and detailed documentation. This is quite helpful for the savvy user who is ready to build a powerful fitness booking website for their gym. Meridian Fitness fulfills design needs for fitness clubs, yoga studios, dance classes, and fitness centers. It is a flexible theme that fits easily with the needs of a club or studio that runs classes or training schedules. This theme includes multiple layout options for pages, trainer profiles, 4 blog layout options and schedule display options. Meridian Fitness includes widgets for newsletter, About Me, Instagram feed, latest posts, and social media icon options. You can choose from a range of color schemes and use demo imports to quickly design the site as well. Plugin support includes MailPoet and others. 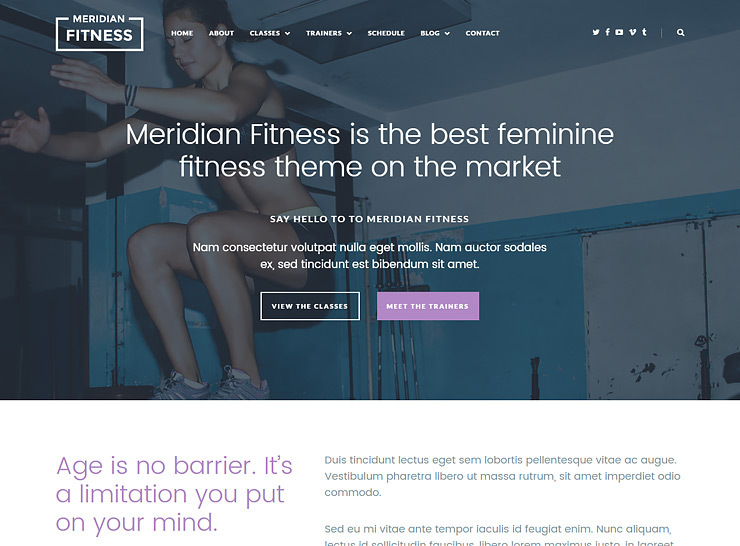 Meridian Fitness is a great theme for the novice user who wants to set up the site quickly. 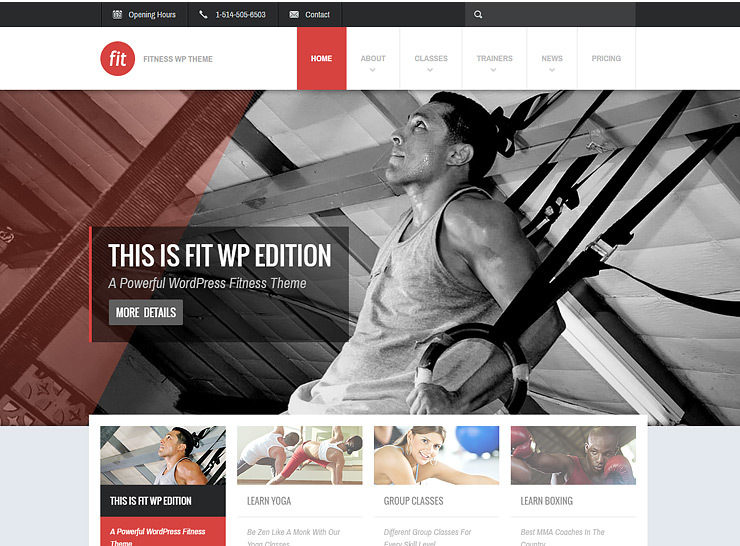 Fitness is a WordPress theme specific to gyms and fitness classes. It comes packed with several demo options and is ideal for businesses who want to put up pictures and galleries of their studios or classes. 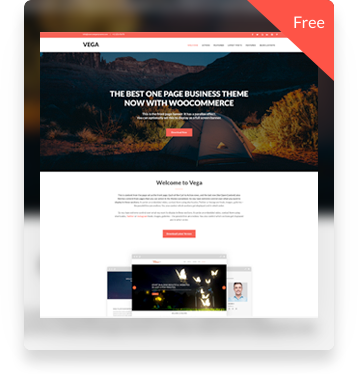 This theme is compatible with top plugins like WooCommerce and Slider Revolution. It comes with two demo versions to choose from. Fitness theme has many widgets and design options for pages, trainer profiles, timetables, and class schedules. You can modify colors, fonts, add maps and make several other design changes as well in this theme. The theme comes with great promise as it includes detailed documentation and design files to modify. Use the one-click demo importer to set up your website quickly.